So this was for YESTERDAY (told you I was behind!) I'm taking more photos than I can edit/put up! AH! 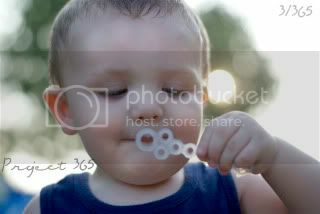 Anyways I chose this picture because my little man decided he was going to blow Emily's bubbles while she was gone inside..he tried with all his might but no matter what I told him kept pressing the bubble wand to his mouth and destroying the bubble 'film' that is in those little holes. But he still laughed and giggled and slung the wand around like he WAS doing something..the innocence of a child. Makes me envious! Thank you! A dear friend of mine talked me into doing project 365 and if i can make it through it will definitely be a big accomplishment for me! And you are welcome and thanks for becoming a follower to my blog!